ROAS (return on ad spend) and ROI (return on investment) are two common methods of ad testing for ecommerce accounts. 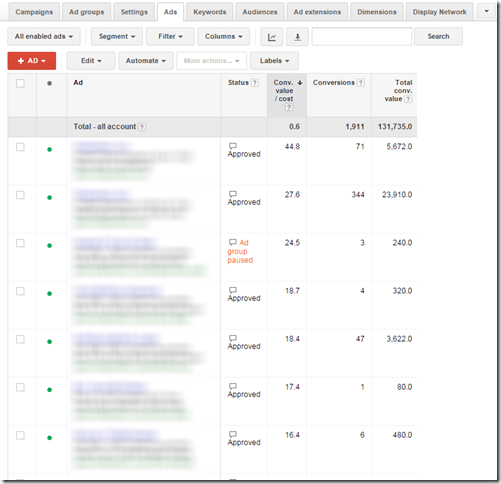 If you are dynamically passing your conversion values to AdWords; then you’ll have a column known as Conv. Value/Cost in your account. This stands for Conversion Value / Cost. This value is calculated based upon how you’re passing data from your system to AdWords. If you are passing the entire checkout amount (hopefully minus shipping); then this value is usually ROAS. If you are passing the checkout amount minus hard goods; then this value is generally ROI. As these metrics can be confusing to work with, you can refer to the previous article on how ROAS and ROI are calculated in PPC. 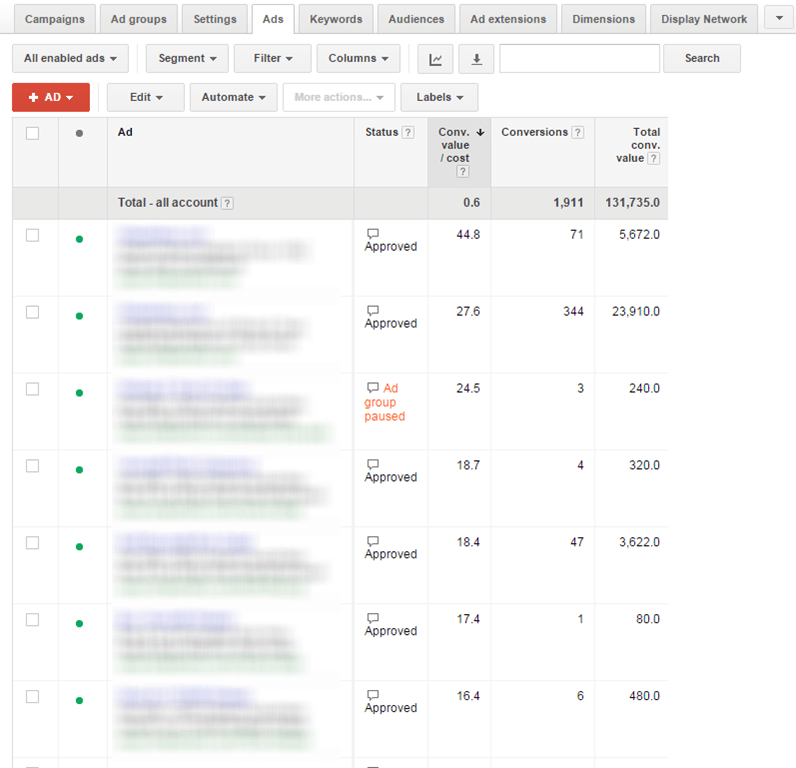 Because this number in AdWords is not always ROAS or ROI, we’re going to use Conv. Value/Cost in today’s article as that’s what you see in your account. Conv. Value / Cost is calculated exactly how you think it would be: It takes the entire conversion value of a data point, such as an ad, and divides that by the cost of that same data point. In this example, ad 4 has the highest Conv. Value/Cost and ad 1 has the lowest. There are two main reasons that companies like to use ROAS as their testing metric. The first is bidding alignment. Many ecommerce companies bid based upon ROAS or ROI; therefore, using that same metric for their ad testing ensures that their ad tests are in alignment with their bidding goals. The second reason is that it ensures the spend is profitable. Many companies require the account to have a positive ROAS, such as 400% to make sure that the account is making money. Often these numbers are inflated above their true goal as they might not be removing costs of goods or other costs from their account, so by inflating the target ROAS or Conv. Value/Cost above their true targets, they know the account or the ad test is making money. If you picked the ad with the highest conv. value/cost, ad 1 at a 10; then you’re only making 900 in profit (assuming there’s no other hard costs). If you picked ad 4, the second highest conv. value/cost then you’d make 4200. If you picked ad 5, one of the lowest conv value/cost; then you’d make 7000. So while ad 5 is best for the company, the highest conv. value over costs is actually one of the least profitable ads. In many cases, our conv. value / cost isn’t actually all profit, its total revenue but hard goods aren’t removed (again, this depends on the data you’re passing to AdWords) so your profit might not be profit, it’s really just revenue minus marketing costs. Therefore, you might have a conv. value target of 5 and your breakeven point is a 3. In that case, ad 5 would lose you a lot of money since it’s actually below your breakeven point. Therefore, you have to filter out any words below a 3 Conv. Value/cost and then take the highest profit word after the filtering is completed, which would be ad 4. The other option would be to first remove all hard costs, and then work from profit in picking your ad tests. Just note, that the highest conversion value/cost or even highest ROI/ROAS ads might not be the most profitable ones for the company. This is common when you place emphasis on high volume low margin ordering versus lower volume higher margin products. Regardless, Conv. Value / Cost can be a great filter to remove ads that aren’t hitting your targets and then you can use other metrics to pick the winners. Using Conversion value/cost is a decent testing metric if you want to align your bid method to your ad testing method. Just remember that conversion value / cost is a metric in AdWords that could correlate to ROI, ROAS, or even another metric depending on its configuration. The downfall of Conversion Value / Cost is that it’s a ratio of revenue to spend. It does not take profit or volume into account. Therefore, this is a good filtering metric to use to remove unprofitable ads before using another metric to determine your winning ads. In our next article, we’ll discuss using RPI (Revenue per impression) as a testing metric. This is often a better metric to use for ecommerce accounts than conv. value / cost for picking the winners. However, even using RPI, you might still use Conv. Value/cost as a filter metric first and then use RPI to pick your winners.